As a dive professional working on a liveaboard dive boat and logging in excess of 500 dives each year, I demand a lot from my gear. Like any professional, you cannot perform to your best without the best gear and I always like to research and select the best gear to do its job, keep me safe and ensure maximum comfort for my hours in the water. Over the years I have owned and used a number of dive torches from entry level to top of the range models, none of which I have been overly impressed with. My latest torch, an Underwater Kinetics C8 eLED Plus has been nothing but trouble for me and seems to spend more time back with the distributor being fixed than doing its job. My particular torch retails at around the $500 mark and not only is it bulky, heavy, unreliable and cumbersome to operate, but the beam performance is quite arguably little better than some torches now available at a fraction of the cost. 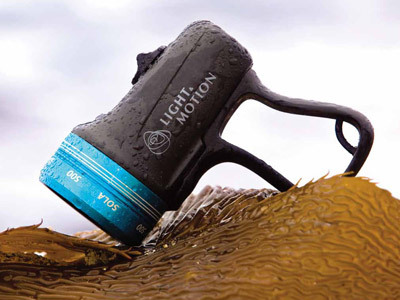 With my past torch experiences in mind, and the fact that it takes a lot to impress me these days, I was sceptical when given the new Light & Motion Sola Dive 600 Light to trial. On first inspection however, I was instantly impressed with the compact size and lightweight nature of the unit, which weighs in at less than a quarter of many standard dive torches. I also liked the fact that the torch is rechargeable, saving the economic and environmental cost of constant battery replacement. It was not until I actually took the torch on my first night dive that I became an instant convert to this product. I can quite honestly say that this is THE BEST dive torch I have ever seen or used and would not dive with anything else after testing it. There are a couple of negatives which I will discuss, however, the positives make these almost irrelevant and I really never thought I could ever get this excited about a torch! The hands-free strap mechanism is a little fiddly to adjust and obviously more time consuming than simply clipping my torch lanyard to my BCD, which I was previously used to. I was rather sceptical of how the hands free mechanism would work in practice but it actually proved to be a real positive, especially given my standard dive style of hands clasped in front of me. The only real negative here is from a teaching perspective, as I always brief my students to shine their torch in towards their chest to highlight their hand signals. Whilst this is possible with the hands free mechanism, it is a little awkward. I am also pretty sure that I have inadvertently dazzled the odd nervous first time night diver when I have had to grab hold of them to reassure them, something that would not normally have been an issue for me before. A small Allan key provided with the system does allow the user to disconnect the hands free strap and attach a more standard landyard to the small D-ring, if preferred. However, after my initial scepticism, I am a big fan of the hands free strap and have not therefore changed the set-up. A simple sliding mechanism operates 3 brightness modes by sliding forward and allows the user to quickly switch from a spot beam to flood beam by sliding back. The torch is easily turned off by sliding and holding the switch in either direction for 2 seconds. The unit can be locked by turning the sliding switch 90 degrees for travelling and storage. Given the torch is a factory sealed unit with no moving parts, there is little that can go wrong and switching the torch on and off does not provide the increased flood risk commonly encountered in other models. Whilst the Sola Dive 600 has 3 brightness settings, I have found that the lowest setting is ample for most of the time. I prefer using the spot beam setting as the norm which really cuts through the darkness, as I find the flood beam tends to highlight the particles in the water a little more. However, the flood is excellent for highlighting areas up close such as lionfish or feeding coral polyps. The wide beam would be very useful for shooting video, for instance, attached to a GoPro Hero. In fact, apparently the Sola Dive 600 is exactly the same as the Sola Video 600, with a different attachment and different coloured bezel. Settings 2 and 3 in spot beam are great for highlighting distant sharks and are easily activated when needed. Sharks seem to be dazzled by the bright spot beam settings which has resulted in a number of close encounters, all of which have been great fun! From a professional perspective, our dedicated lookout can always identify my group in the water from the sheer power of my beam, which is clearly a benefit. I have never had so many comments about a torch since using the Sola Dive Light, with many of my customers not even bothering to use their torches, but simply tucking in behind me on the dives and enjoying the light show! I do two night dives each week and the torch charge indicator goes from green (fully charged) to yellow (50-75% charged) after the second dive. A red light indicates 25-50% charged with a blinking red light indicating less than 25% charged. However, due to the quick charging of the unit, I have not yet seen the red indicator lights in action. What has really surprised me about the Sola Light is how much I actually use it during the day now. Given the fact that the torch is so lightweight, hands free and easy to use, I will quite often take it out on day dives. The torch is great on deep dives for highlighting colour absorption at depth to students and the hands free mechanism means that I have 2 hands free for any event that may occur. 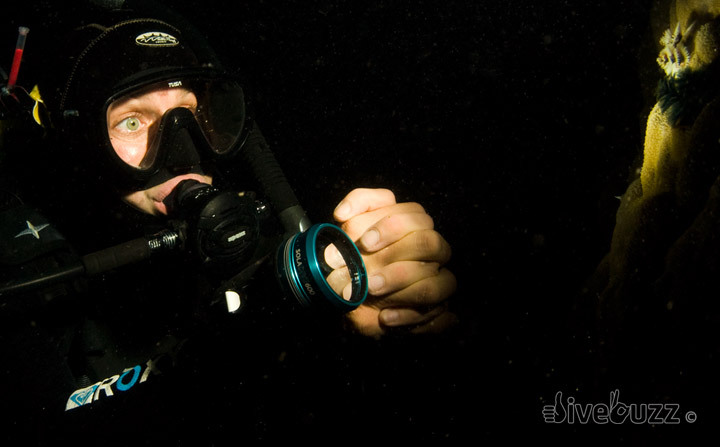 In summary, a truly great new product, well designed, easy to use and extremely powerful and in line with the Sola Dive Light strap line, it has changed my night diving experience forever! 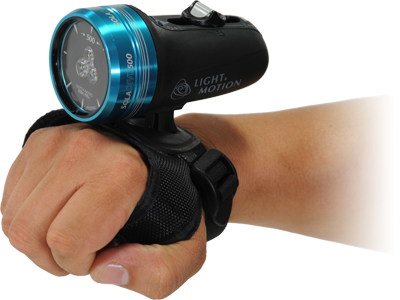 The Sola Dive light range had an update at the start of 2012. The Sola Dive 600 was replaced by the Sola Dive 800, and the Sola Dive 1200 was added to the range. The hands-free strap had a slight design improvement, with increased padding and support. And a pistol grip was also introduced, as an alternative to the hands-free mount, making for a very compact, handy torch. This is so well designed that it appears like it always was intended to be like this. ← Do women get colder than men on dives?